I wrote this recipe as a one of my “Cures for the Carboholic” since it tastes rich but is actually low fat. Creamy dishes that are low in fat but high in protein are just the thing to keep you feeling full and stop you from reaching for the bread! Coat a large skillet with cooking spray. Heat over high and add the oil. Sprinkle the fish with half the salt, the pepper and flour. Place the fish in the skillet when the oil is hot. Cook 3-4 minutes until a crisp, golden crust forms. Turn the fish and continue to cook 2-3 minutes until it is no longer translucent inside. Remove to plate. In the same skillet, add tomatoes, lemon juice, wine, and cook 1-2 minutes until the tomatoes begin to soften and form a sauce. Stir in goat cheese, cream cheese, and remaining salt. Return the fish to the skillet and sprinkle with basil. Serve immediately. Nutritional Stats Per Serving (1 piece plus sauce): 288 calories, 40 g protein, 8 g carbohydrates, 10 g fat (4 g saturated), 93 mg cholesterol, 1 g fiber, 398 mg sodium. Serve with Asparagus Soup or Sauteed Spinach. I loved this!! 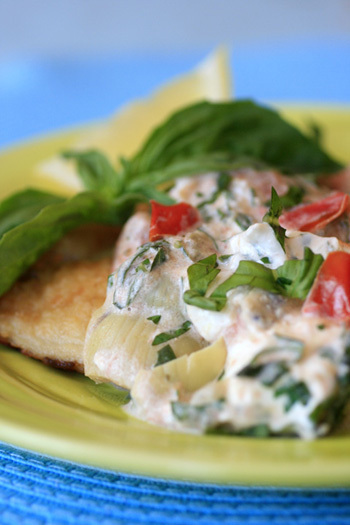 !I used pacific rock cod,my guest said it all,healthy and naughty,thank you goat cheese. Thank you for such a delicious and healthy recipe! Even my 2 and 4 year old love it, tomatoes and all. I made a version of this last night and truly it was wonderful. Will become a favorite when I can get really good fish. I used fresh grouper, fantastic. Thanks for the recipe.